It’s probably safe to say, that when asked which fruit is the most popular fruit in the world, the majority of Americans and Canadians would respond with apples or bananas. To the astonishment of most North Americans, mangoes are consumed worldwide by a factor of three to one over bananas and ten to one over apples. Although mangoes are still considered to be exotic fruits in America, ranking as number 24 of the top 25 fruits consumed in the US, they are considered to be staples in India, South Asia, China, and Latin America; often being referred to as “the king of the fruits”. Evidently, those in the many far corners of the world have learned something that has yet to be discovered in North America! There are over 2,000 different varieties of mangoes ranging in size from a few ounces to as much as four pounds. One thing they all have in common is their nutritional value; mangoes are a fantastic source of vitamins C and E, niacin, potassium, iron, and beta carotene which converts to vitamin A in the body. The fresh, ripe mango is a very juicy and sweet fruit with a unique and delicious taste. Some mangoes have a soft and pulpy texture similar to an over-ripe plum, while others have a firmer flesh similar to that of a cantaloupe. 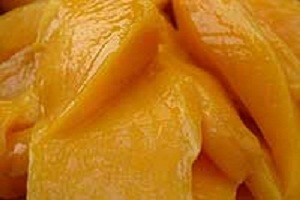 Mangoes are widely used in chutney, fruit bars, cereal products, juices, pies, ice creams, and even milk shakes. Although a little messy due to their high juice content, they can be enjoyed simply by slicing the fruit as you would a peach or pear. Okay, now that we know what the most popular fruit in the world is, we must determine from where in the world these mangoes come. 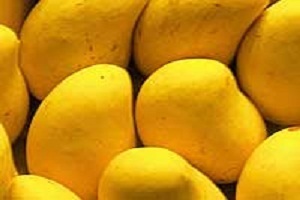 Mangoes are grown throughout the tropics but India is by far the largest producer and consumer of mangoes in the world. In fact, for more than 6,000 years, mango trees have been a status symbol in India. Behind India are other areas within South Asia and parts of Australia. 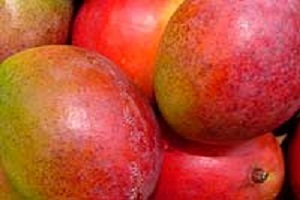 It wasn’t until the 19th century that mangoes were introduced to parts of Africa, South America, Hawaii, and Mexico. For years, India has been unsuccessfully negotiating the exportation of mangoes to the US, however just recently some agreements have been finalized, clearing the way for exportation of mangoes from India to the US. In return, they will allow the US to export peas, beans, almonds, and would you believe, Harley Davidson motorcycles to India. Of those mangoes that currently make their way to the US and Canada, approximately 80% come from Mexico with the majority being grown in the Mexican state of Nayarit which is on the same latitude as Hawaii. Nayarit, one of Mexico’s 31 states, is located along the Pacific Ocean having its southern border with the state of Jalisco. The beautiful tourist destination and retirement community of Puerto Vallarta lies at the border of these two states with its downtown area or El Centro located in Jalisco and Nuevo Vallarta located in Nayarit. Puerto Vallarta is located at the northern end of the Mexican Riviera and just recently, Fonatur, the National Tourism and Development Board of Mexico, has coined the term Riviera Nayarit for that section of pristine and majestic Pacific shoreline in the state of Nayarit. As a note of interest, Fonatur has recently earmarked billions of dollars for a 15 year development program that will include more than 20,000 new condos and villas with the associated infrastructure. This entire area is surrounded by mango orchards where approximately 1.5 million metric tons of mangoes are grown annually, making Mexico the third largest producer of mangoes after India and China. After vacationing in Vallarta two or three times a year for 15 years we decided to move there in 1997 and make Vallarta our permanent retirement destination. We bought our dream villa on the mountainside with a panoramic view of Banderas Bay in an area known as the Beverly Hills of Vallarta. One of our first projects was to landscape the ½ acre mountainside lot. With an abundance of tropical flowers and fruit trees available, the choice of plants was difficult and somewhat overwhelming. After living in the States for 55 years, we were virtually oblivious to the qualities that mangoes had to offer. However, due to their abundance in the local supermarkets, we decided to give them a try. To our surprise, they were absolutely delicious; perhaps better than any fruit we’d ever had! A decade later, after enjoying a constant supply of mangoes for ten years, it’s hard to imagine that we went a lifetime without enjoying mangoes and that so many other North Americans have also missed out on this experience. Okay, back to the landscaping project. Since we were introduced to the numerous beneficial qualities that the mangoes offered, we decided to plant some mango trees and were directed to a nursery in Nayarit, about 10 miles from home. 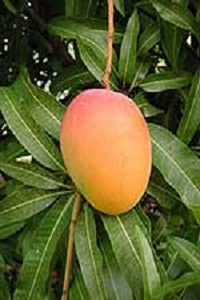 The nursery was located on the edge of a huge mango orchard where mangoes grew as far as the eye could see. The owners of the orchard/nursery gave us a short presentation on mangoes, briefly outlining the differences between the varieties grown there. After the presentation, they asked us why we were buying mango trees. We informed them that we loved the taste of mangoes and were landscaping our new yard and thought it would be nice to have fresh mangoes available. As is so typical in Mexico, rather than selling us some mango trees, they suggested we save the time, hassle, and money and just help ourselves to the mangoes. They pointed out to the orchard and indicated that there were millions of mangoes and that we could have all that we wanted for free; they would even help us fill up the car if we needed help! We never did buy those trees but do have an unlimited supply of those delicious mangoes! That was one of our first lessons learned in Vallarta as it pertains to the Mexican hospitality. It’s no wonder that Puerto Vallarta was selected as the friendliest resort destination in the world by a recent survey of Conde Nast readers. One of the reasons for the friendliness of the area is probably due to its perfect climate. Not only perfect for mangoes, but with an average daily temperature of 73°F for seven months of the year, it’s perfect for its residents. In summarizing, if you’re interested in sampling some of the most popular fruit in the world, you might just want to visit the most popular resort destination in the world, Puerto Vallarta, Mexico, and have some real fun while sipping your mango margarita!